I’m usually not the first one to suggest dining at a German-style restaurant. Their food and atmosphere is typically not top of mind when thinking of where I would like to go for dinner or happy hour. 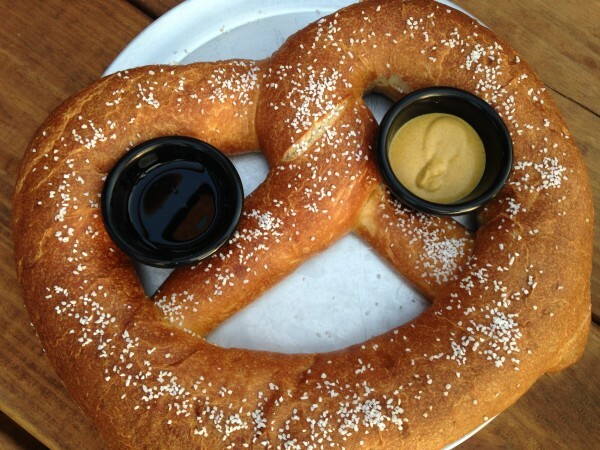 However, when I saw that the Glass Boot Biergarten (formerly known as the Black Forest Biergarten, more on the name change later) had a giant Bavarian soft pretzel on the menu, I just had to check it out! It’s seriously as big as your head, if not bigger. Served with melted butter and a traditional German mustard. 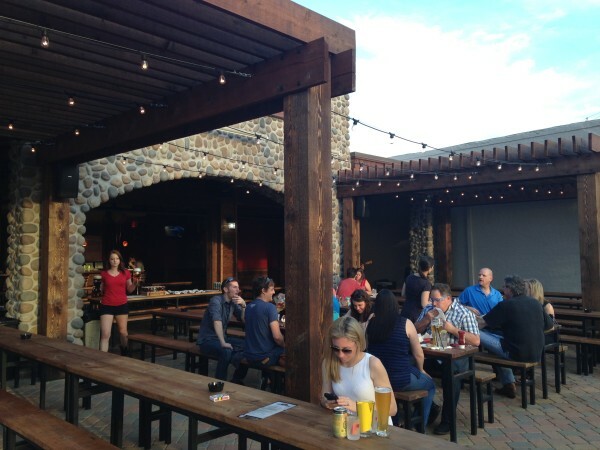 Atmosphere is the name of the game at the Glass Boot Biergarten. With their amazing corner location off of Henderson & McMillan, it’s within easy walking distance of lower Greenville or you can stay for a while and enjoy their live music. The patio is spacious with amazing views of bustling Henderson in lower Greenville. I was able to chat briefly with one half of the owner pair, Di Ann Bogus, and ask what was the full story behind their name change. Formerly known as the Black Forest Biergarten and slated to open their doors to the public in March, plans came to a screeching halt when Di Ann discovered that their name was already taken! Di Ann admitted that while it threw a small wrench into their plans, she was going to press on, thus the Glass Boot Biergarten name was born. The name also brought along with it a notable 33.8 oz. mascot- an actual glass boot. This is a must see and try when you check out The Glass Boot Biergarten. It’s in the name! I sampled the traditional German fares on my visit and was pleasantly surprised at how much I enjoyed EVERYTHING. With German food not being on the top of my list of favorites, I didn’t know what to expect but that Bavarian Pretzel was calling my name. I had to try it all. Beer and spice, knowing I enjoyed those flavors I chose a traditional wurst called the Beerwurst paired with their spicy red sauerkraut. I couldn’t have been happier with my choices! Plus, they served traditional German mustard that I had to ask for seconds on because it tasted so yummy on my brat. I will admit that never before have I liked sauerkraut until I ate the Glass Boot Biergarten’s spicy red sauerkraut. Now that’s sayin’ something. Seriously, if you go, you must give it a try. It was delicious- tangy, crunchy, salty and spicy. 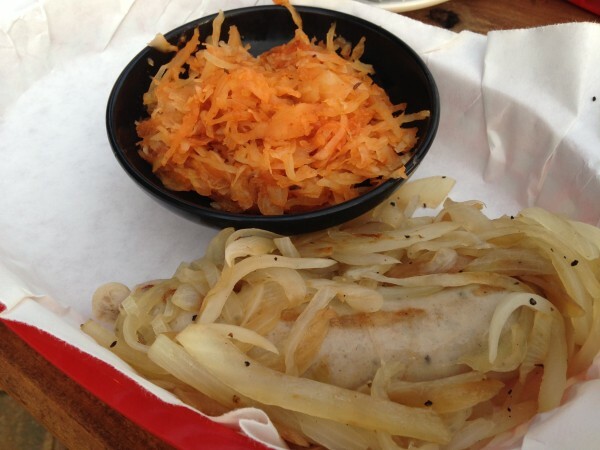 The beerwurst paird with spicy red sauerkraut with a side of grilled onions. Very tasty followed by some bad breath. So to the Glass Boot Biergarten I say thank you. Thank you for changing my opinion on German foods. You have officially made a new fan & I can’t wait to go back.